Home > Newsletter Specials > Mothers Polish-Wax-Cleaners > Mothers Professional Polishes & Compounds FREE BONUS! Mothers Professional Polishes & Compounds FREE BONUS! Mother's Professional polishes are designed for the professional detailer to correct a broad range of paint imperfections using a rotary polisher. The polishing system includes five polishes made to work in sequence to deliver flawless results. Mother's advanced formulas are designed for everything from new car prep to compounding to polishing. The chart below will guide you through polish selection and their applications. 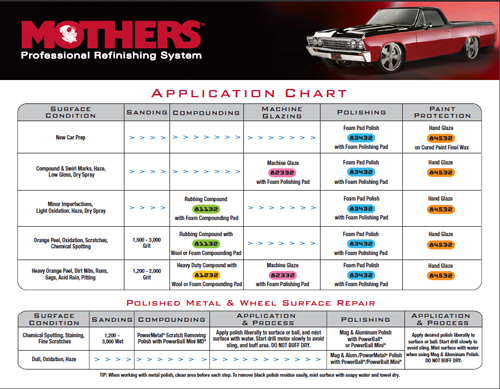 Mother's Professional Refinishing System brings Mother's expertise to the professional detailer. Mothers Professional Rubbing Compound 12 oz. Mothers Professional Finishing Polish 12 oz. Mothers Professional Instant Detailer 24 oz. Mothers Professional Rubbing Compound 128 oz.